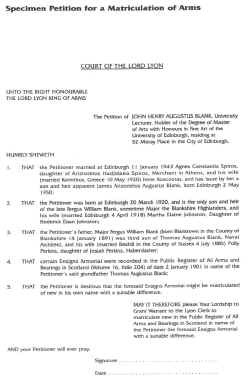 On behalf of the Sovereign, the Lord Lyon King of Arms exercises the Royal Prerogative committed to him by the Acts of 1672 cap. 47 and 1867 30 & 31 Vict. cap. 17, to grant Arms to "virtuous and well deserving persons". The Court of the Lord Lyon is a court of law, and applications for Arms are made by a formal "Petition". This is done on the initiative of the person wishing to obtain Arms, who submits a Petition to the Lord Lyon stating who he is and asking for Arms to be granted to him. The process is not complicated, and there are three main varieties of Petition which are listed on the opposite page and are set out in detail in this leaflet. Advice on any special difficulties or any matters not covered can be obtained by writing to the Lyon Clerk at the Court of the Lord Lyon, H.M. New Register House, Edinburgh, EH1 3YT, and to whom all completed Petitions should be sent. All such correspondence is ‘CONFIDENTIAL'. Once Arms have been granted and recorded in the Public Register of All Arms and Bearings in Scotland, they are protected under the law of Scotland. Any infringement of a person’s armorial rights in Scotland may be drawn to the attention of the Procurator Fiscal to the Court of the Lord Lyon, who may mount any necessary prosecution of the offender. In return for this permanent legal protection and for the maintenance of the permanent registration of Arms in the Court of the Lord Lyon, fees are charged to the Petitioner. These fees are made up of the dues to H.M. Treasury, Herald Painter’s fees and costs of materials in preparing the Petitioner’s Letters Patent. This is his title deed to his Arms, written in a formal script on vellum, illustrating his Arms in full colour, and sealed with the Seal of the Lord Lyon King of Arms. The fees are fixed by Statute, and rise from time to time. The current scale is set out on the separate sheet appended to this leaflet. 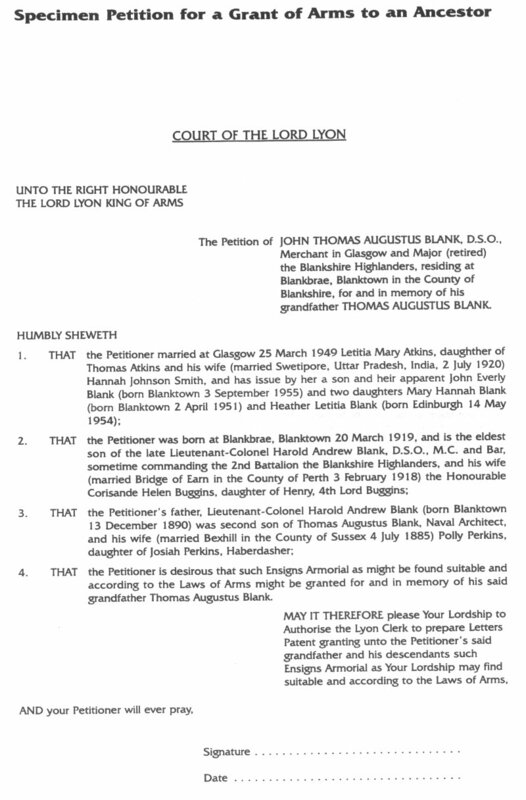 All statements made in Petitions must be accompanied by legal proof, usually Certificates of Birth and Marriage for statements of parentage and ancestry. It is the Petitioner’s responsibility to provide this proof. Neither the Lord Lyon nor the Lyon Clerk may take any part in providing the proof. Petitioners may employ their own genealogists to provide the proof. They may employ any of them directly, at their own responsibility, or with the assistance of an Officer of Arms. The person wishing to apply for a new Grant of Arms to himself should do so by submitting a formal Petition to the Lord Lyon King of Arms drawn up as in the fictitious SPECIMEN on page 3 opposite. At the top, the Petitioner should state his Christian names in full and his surname, followed by any rank, decorations, qualifications and profession or occupation, and end the paragraph with "residing at" followed by his address. Beneath "HUMBLY SHEWETH" the Petitioner should set out his ancestry, or as much of it as he wishes to have included in his Grant of Arms and can prove. The Petitioner should set out the details of his ancestry in numbered paragraphs, one per generation. The proofs required are Certificates of Birth or Marriage for each fact stated, or Certified Extracts from appropriate Registers, Census Records, Wills, Sasines, etc. The Certificates should be accompanied by a separate "SCHEDULE OF PROOFS", with the Certificates numbered as per the paragraphs in the Petition and listed according to the facts they prove. A SPECIMEN SCHEDULE OF PROOFS for the SPECIMEN PETITION opposite is given on the back page of this leaflet. The Petition should then be signed and dated and sent with its accompanying Certificates and SCHEDULE OF PROOFS to Lyon Clerk of the Court of the Lord Lyon. It should be accompanied by a covering letter from the Petitioner, indicating his views and wishes on the following subjects. The Letters Patent, which the Petitioner will eventually receive when the Arms are granted, is a formal title deed from the Crown. It is permanent in effect, granting the Arms for ever and protecting them in the Laws of Scotland. The Arms granted are heritable property, and will be inherited by the petitioner’s heir, normally his eldest son, and by his eldest son in turn, and so on for ever. Younger children inherit only a right to matriculate the Arms with a slight difference added, and they must petition separately for this to be done, as is set out on pp. 7 and 8 of this leaflet. The form and content of the Arms should therefore be very carefully considered before the Petitioner is permanently committed to them. The Lord Lyon is pleased to consider the Petitioner’s own suggestions, and will write and discuss them with him once the Petition has been received. The Petitioner should also carefully consider whom he wishes to inherit his Arms or a different version of them. His wish is set out as a "destination" for the Arms, destining them to all his descendants, or the descendants of the father, or to any other such limitation. The Lord Lyon will be pleased to discuss this too with the Petitioner, and will advise him as need be. When these matters have been agreed, the Lord Lyon will pronounce his judgement and instruct Lyon Clerk to prepare the Petitioner’s Letters Patent. The Petitioner will then receive from Lyon Clerk a draft text for the Letters Patent for him to check and approve, and a note of the fees to H.M. Treasury and the Herald Painter which must now be paid. Once the draft text has been approved and the fees paid by the Petitioner, the Lyon Clerk will in due course send him the Letters Patent granting the Arms. A copy of the Arms and the text of the Letters Patent Is placed on record in name of the Petitioner in the Public Register of All Arms and Bearings in Scotland, and the process is complete. This procedure may be used for nationals of other countries who wish Armorial bearings. The applicant is called "The Petitioner", and should submit a formal "Petition" to the Lord Lyon King of Arms, drawn up as in the fictitious SPECIMEN on page 5 opposite. 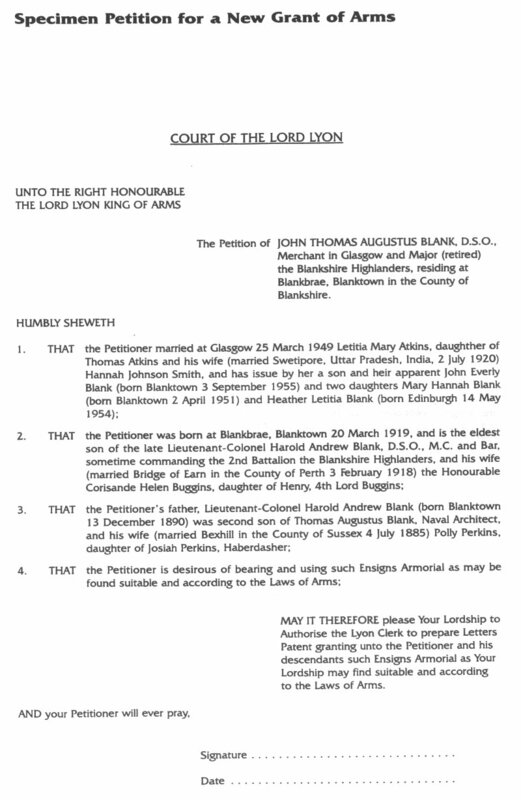 At the top, the Petitioner should state his Christian names in full and his surname, followed by any rank, decorations, academic qualifications, profession or occupation, ending with "residing at..." followed by his address in full and the words "for and in memory of" his chosen ancestor for whom the Arms are being sought. Beneath "HUMBLY SHEWETH" the Petitioner should set out his ancestry, back to the ancestor for whom the retrospective Grant is being sought, in numbered paragraphs in the way explained on page 4 of this leaflet. This account should be accompanied by Certificates of Birth and Marriage for each fact, and a separate SCHEDULE OF PROOFS listing them as explained on page 4. Beneath the last paragraph of the ancestry, a final paragraph (No. 4 opposite) should state the Petitioner’s wish in the wording shown. This Is repeated In the Prayer at the end, after "MAY IT THEREFORE", in the wording shown opposite. The Petition should then be signed and dated and sent with Its accompanying Certificates and SCHEDULE OF PROOFS to the Lyon Clerk at the Court of the Lord Lyon, with a covering letter setting out any ideas the Petitioner may have about the form of the Arms to be granted. The Lord Lyon will later write and discuss these with the Petitioner. When these matters have been agreed, the Lord Lyon will pronounce his judgement as to the form of the Arms, and instruct Lyon Clerk to prepare the Letters Patent which is the formal title deed to the Arms. The Petitioner will then receive from Lyon Clerk a draft text for the Letters Patent for him to check and approve, and a note of the fees due to H.M. Treasury and the Herald Painter, which must now be paid. Once the draft text has been approved and the fees paid, the Lyon Clerk will in due course send the Petitioner the Letters Patent granting the Arms to him. A copy of the Arms and the text of the Letters Patent is placed on record in name of the Petitioner in the Public Register of All Arms and Bearings in Scotland, and the process is complete. NOTE:- In the SPECIMEN opposite, the Arms sought for and in memory of Thomas Augustus Blank will NOT have descended to the Petitioner, because his father Lieutenant-Colonel Harold Andrew Blank was NOT the eldest son of Thomas Augustus Blank. Lieutenant-Colonel Blank was the second son, and the direct inheritance of the Arms of Thomas Augustus Blank will have gone off to Lieutenant-Colonel Blank’s elder brother. Thus the Petitioner will have to apply further for a Matriculation of Arms as set out on pages 7 and 8. All his male cousins will be in the same predicament, except the eldest son of the eldest son of Thomas Augustus Blank. It is not unknown for such groups of cousins to dub together to share the cost of the retrospective Grant to the ancestor, because thereafter they are all entitled to Matriculate cadet Arms off the ancestor’s which is much less expensive as is set out In the Scale of Fees appended to this leaflet. Arms are heritable property, and on the original owner’s death they descend in terms of the destination, but usually to his eldest son, and in turn to his eldest son, and so on for ever. A younger brother may inherit his father’s Arms if the elder brother dies first and leaves no heirs of his own. Otherwise younger sons and their descendants inherit a right to apply for a Matriculation of their ancestral Arms with a small mark of difference added, appropriate to their place in the family. 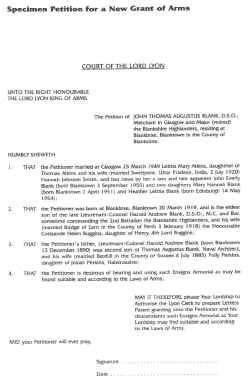 A descendant applying for Arms is called the Petitioner, and he should submit a formal Petition to the Lord Lyon King of Arms, drawn up as in the fictitious SPECIMEN on page 7 opposite. In it he should set out his descent from the ancestor who had recorded Arms and ask for the Arms to be "matriculated" in his own name with a suitable mark of difference. At the top, the Petitioner should state his Christian names in full and his surname, followed by any rank, decorations, academic qualifications and honours, profession or occupation, and "residing at" followed by his address in full. 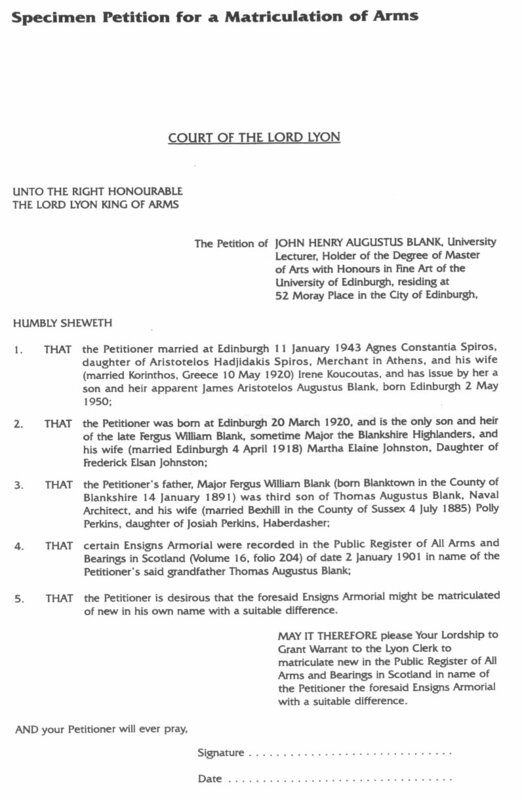 Beneath "HUMBLY SHEWETH" the Petitioner should set out his ancestry, back to the ancestor who had recorded Arms. This should be done in numbered paragraphs, one to each generation, in the way explained on page 4 of this leaflet and shown opposite. Proof of each fact stated is required in the same way as on page 4 and accompanied by a SCHEDULE OF PROOFS as shown on page 11. Beneath the last paragraph of the ancestry, in a separate paragraph (No.4 opposite) the Petitioner should set out the record of his ancestor’s Arms in the Public Register of All Arms Bearings in Scotland in the way shown. Finally he should formally state his wish in the wording shown on paragraph 5 opposite, and repeat this wish in the formal Prayer at the end in the wording shown opposite. 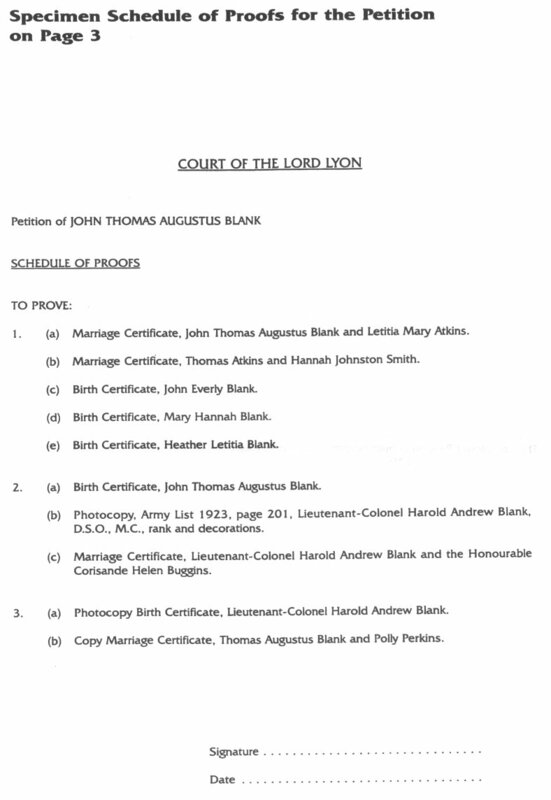 The completed Petition should then be signed and dated and sent with its accompanying Certificates of Birth and Marriage and the SCHEDULE OF PROOFS (see pages 4 and 11) to the Lyon Clerk at the Court of the Lord Lyon. While the Arms will resemble the ancestor’s, the Crest and Motto can vary considerably from the ancestor’s, perhaps reflecting the Petitioner’s own occupation and outlook on life. The Lord Lyon will welcome the Petitioner’s own views, and will discuss them with the Petitioner. When these matters have been agreed, the Petitioner will receive for his approval a draft text for his Matriculation of Arms document, which is his title deed to the Arms, and a note of the fees due at this point. Once the draft text has been approved and the fees paid by the Petitioner, the Lyon Clerk will in due course send him his Extract of Matriculation. A copy of the Arms and the text of the document is placed on record in name of the Petitioner in the Public Register of All Arms and Bearings in Scotland, and the process is complete. Corporate Bodies, such as local authorities, corporations, companies, limited companies, partnerships, schools or any other formally established group of people banded together for a common purpose, may apply for Arms. When granted, the corporate body may then use its Arms in the same way as a private person, to signify its identity and to mark its property or its products. The Arms are the visual equivalent of the corporate body’s name, and may be used wherever the written name would be appropriate, either instead of the name or accompanying it. 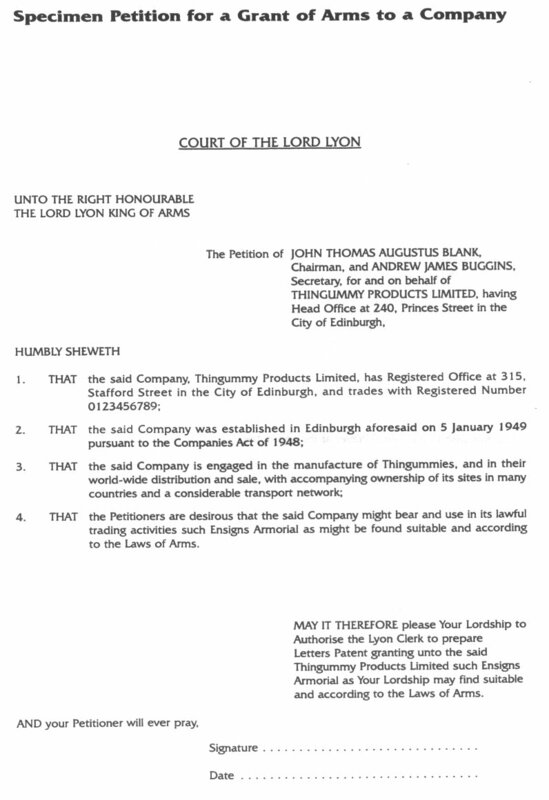 Guidance on the correct usage of corporate Arms may be obtained from the Court of the Lord Lyon. The application for Arms should be made as a formal Petition to the Lord Lyon King of Arms, drawn up as in the fictitious SPECIMEN on page 9 opposite. At the top, the Petition should state the full Christian name and surname of an office bearer or official of the organisation concerned, then "for and on behalf of" and the corporate body’s name, ending with "having Head Office at" and the address. Beneath "HUMBLY SHEWETH" a brief account of the corporate body’s history activities and standing should be given in numbered paragraphs, one fact per paragraph. The Petition should be accompanied by proofs of these facts, such as Articles of Association and Annual audited Accounts. The proofs should be listed and numbered as they are in the paragraphs setting out the facts they prove in a separate SCHEDULE OF PROOFS, as shown in the genealogical SPECIMEN on page II of this leaflet. Beneath this account, a final paragraph (No. 4 opposite) should state the Petitioner’s plea in the formal wording shown. This is repeated in the Prayer, after "MAY IT THEREFORE", in the wording shown. 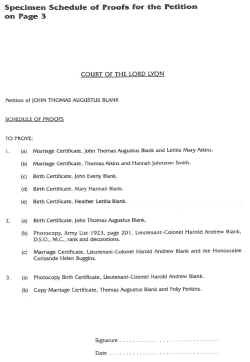 The completed Petition should be signed and dated by the Petitioners and sent with its proofs and SCHEDULE OF PROOFS to the Lyon Clerk at the Court of the Lord Lyon. Arms are granted only to proven reputable corporate bodies, and generally they are required to have been successfully in existence for at least three years before they can be granted Arms. Arms are not granted to transient bodies or associations. 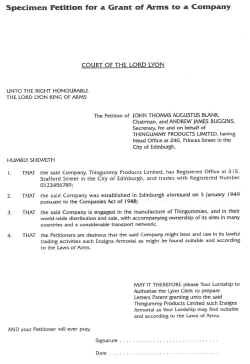 A covering letter with the Petition may set out the Petitioners’ own ideas of the form of the Arms preferred, which should be relevant to the corporate bodies' activities, and which the Lord Lyon King of Arms will discuss with them. The Petition may be withdrawn at any time if this agreement is not achieved. When these matters have been agreed, the Lord Lyon will pronounce his judgement and instruct the Lyon Clerk to prepare the Letters Patent. The Petitioners will then receive from Lyon Clerk a draft text for the Letters Patent for them to check and approve, and a note of the fees to H.M. Treasury and the Herald Painter, which must now be paid. Once the draft text has been approved and the fees paid, the Lyon Clerk will in due course send them the Letters Patent granting the Arms. A copy of the Arms and the text of the Letters Patent is placed on record in the Public Register of All Arms and Bearings in Scotland in name of the Petitioners, and the process is complete.